This tiny island in the Aegean Sea has a local population of about 500 people that more than doubles during summer. It relies on fossil fuels to cover its energy needs. Tilos receives electricity via an underwater cable from a diesel power plant on the nearby island of Kos. However, the subsea interconnection isn't reliable due to the frequent occurrence of faults that cause power cuts. These blackouts affect the businesses on Tilos, where tourism is the main source of revenue. After severe outages, emergency diesel generators are activated manually, further increasing the carbon footprint. But this is set to change with the help of the ongoing TILOS project. According to a recent news item on the project website, the consortium "completed the commissioning stage of the integrated Battery Energy Storage System on the island of Tilos, which signals the beginning of the system's trial operation in consumer mode." The project's main goal is to demonstrate the potential of "local/small-scale battery storage to serve a multi-purpose role within an island microgrid that also interacts with a main electricity network." Its prototype hybrid system for electricity production and storage consists of a medium-scale wind turbine of 800 kW, a small-scale photovoltaic park of 160 kW and a battery storage system of 2.4 MWh useful energy capacity. Apart from the hybrid power station, smart meters and demand-side management devices also contribute to the project's vision of achieving the highest possible electricity autonomy. The system can cover approximately 70 percent of local demand in stand-alone operation, with the aim being to get close to 100 percent in the near future. Quoted in the Associated Press, project manager Spyros Aliferis emphasised the importance of the energy storage aspect: "The energy produced by the wind turbines and the photovoltaics will be stored in batteries, so that this energy can be used for the grid when there is demand." 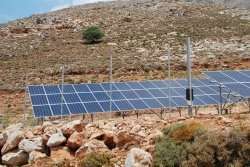 As it shifts away from traditional fossil fuel reliance by harnessing the power of the wind and sun, Tilos island might soon be exporting energy to Kos instead of importing oil-based electricity. Other island regions also participate in the TILOS (Technology Innovation for the Local Scale, Optimum Integration of Battery Energy Storage) project. These include Pellworm (Germany), La Graciosa (Portugal) and Corsica (France). A project flyer explains: "The overall idea is to create a special platform that will enable technological know-how transfer between islands, by also exploiting the experience gained from the smart grid system of Pellworm, and that will designate new opportunities for the development of similar systems in other islands." Project partners believe TILOS "will set the foundations for the future development and replication of similar hybrid systems in island regions and remote communities facing energy-related problems."